We use emojis for everything else these days, so it’s only to be expected that eventually someone would invent an emoji cocktail menu, right? That’s exactly what the Sunken Harbor Club in New York has done, and believe you me, it’ll really make you work before you can order your drink. Seriously, you guys — it’s like playing Pictionary with iMessage characters, with the reward being the privilege of imbibing the cocktail of the name you just guessed. Fun? Infuriating? Both? You be the judge. The Sunken Harbor Club is sort of a pop-up Tiki bar. It takes up residence in Brooklyn’s Fort Defiance bar on Thursday nights, transforming itself into the kitschy, rum-soaked watering hole of your dreams. It describes itself as “a delightful way to start a hangover” — and given what tropical drinks tend to do to me, I don’t doubt it. According to Grub Street, though, the Sunken Harbor Club menu will be getting a technologically savvy makeover tonight, with eight of its refreshing adult beverage names rendered strictly in emoji phrases. Yesterday, a teaser image of a text message exchange appeared on the Sunken Harbor Club’s Facebook page. Equal parts menu-planning and guessing game, it reveals a few of the drinks that will be on offer: The “Fog” Cutter (frog plus scissors), Planter’s Punch (two plants and a fist), and the Pooh-Bah (pile of poo plus sheep). Clever, no? The full key can be seen here; stop by tonight from 5:30 p.m. onward to check the whole thing out for yourselves. Fort Defiance is located in Red Hook, which might be a bit of a schlep for some — the B61 bus goes right there, though, so it's not really that difficult to get to. It's right by the IKEA, which I'm pretty sure every young professional in New York has been to at least once. If you can drag yourself out there to buy a bunch of flat-pack furniture that will drive you nuts as you try to put it together, you can do it for a fun night of booze and emojis, too. 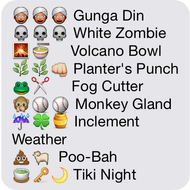 But who says emoji menu names have to be limited to Tiki bar offerings? Here are a few others that might work, courtesy of yours truly. Got any to add? (I know, I know — this one is a stretch, but work with me here).